(Nanowerk News) Funding was granted by the German Federal Ministry of Education and Research (BMBF) to develop an innovative recycling process for valuable battery materials to be reinserted into the battery supply chain. The goal of the NEW-BAT project is a robust, energy efficient and economically viable system with wide application potential. Lithium-ion batteries are key elements in electromobility and a successful energy turnaround. The widespread use of these energy storage devices will come along with large quantities of spent batteries which itself constitute a valuable source of raw materials. Today, only energy-intensive metallurgical methods are in place to recycle used batteries and scrap materials from battery production, and even these are limited to the recovery of elementary metals. This way, profitability can only be achieved for metals like nickel, cobalt, or manganese. It would make economic sense, however, to recover the actual battery materials. Their production from base elements is costly and complex. The recovery of high-grade lithium metal oxides, for example, or hitherto non-recyclable carbon compounds could mean significant savings in energy and cost and could contribute to securing valuable resources like lithium. This is the starting point of the NEW-BAT project which has been granted 1.6 million euros funding within the framework of the »r4« research initiative of the German Federal Ministry of Education and Research BMBF (r4 – Innovative technologies for resource efficiency – Research for the supply of raw materials of strategic economic importance). In NEW-BAT, scientists and engineers from research institutions and industry join forces to develop a new system to completely recover and process all battery materials for direct re-use in new batteries. The team is led by Andreas Bittner from the Fraunhofer Project Group for Materials Recycling and Resource Strategies IWKS. The most distinctive feature of the new recycling process is the electro-hydraulic materials fragmentation by shock waves. This takes place under water or in other liquids. The shock waves are generated by an electrical discharge, and the water or other liquid serves to uniformly impart them onto the infeed material. This method enables composites and building blocks to come apart at the interfaces of different materials in a practically non-contact manner. 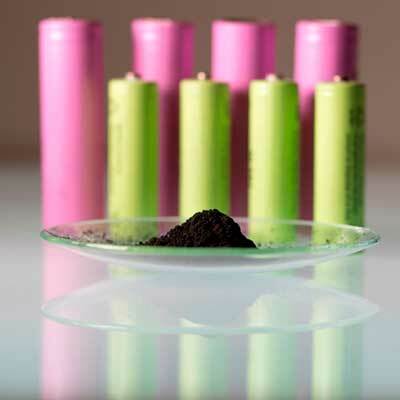 The material mix thus derived from the many battery components – cathode, anode, electrolyte, separator as well as cell and battery casings – can then be sorted out efficiently in a next step. In order to obtain the purest recyclates possible, separation methods account for physical properties such as grain size and density as well as for varied chemical compositions. At no point does this method involve high temperature processes which renders it much more energy-efficient than metallurgical recycling technologies. It is equally suitable for spent batteries and scrap material from battery production. It is the electrode materials that age the most during a battery’s life. Recycled materials therefore must be carefully tested and treated to restore their original quality. Project partner Fraunhofer ISC is in the position to offer special low temperature procedures suitable for Lithium-ion battery materials to remove undesirable degradation products from surfaces and to repair crystal structure defects. This treatment can even be combined with the application of a finishing core-shell coating which significantly improves the life and the charge and discharge properties of the recycled materials. The two R&D partners – the Fraunhofer Project Group for Materials Recycling and Resource Strategies IWKS at Alzenau and Hanau, acting as project coordinator, and its parent institute the Fraunhofer Institute for Silicate Research ISC at Würzburg – contribute with their profound expertise and experience in the areas of recycling, substitution, and resource strategies as well as in the development of materials and electrochemical energy storage devices. The consortium’s competence is complemented by its industry partners from recycling, battery manufacturing and plant engineering, the Lars Walch GmbH & Co. KG at Baudenbach, the GRS Service GmbH at Hamburg and the ImpulsTec GmbH located in Dresden.